Don't miss out. There's only 4 available and 11 other people have this in their cart right now. Don't miss out. There's only 1 available, and 11 other people have this in their cart right now. 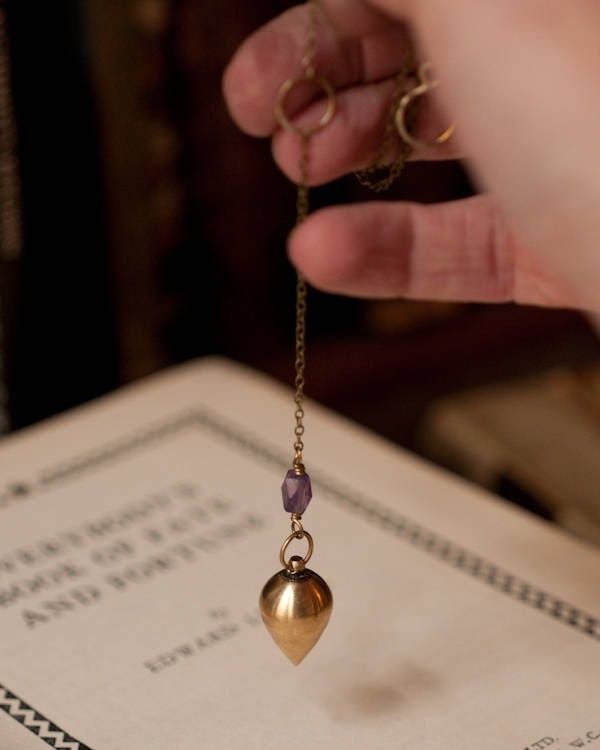 Pendulum necklace, clairvoyance talisman, divination tool, amethyst and brass pendulum in brass or gold fill or silver plated, intuition amulet, dowsing necklace, magick, fortune telling. 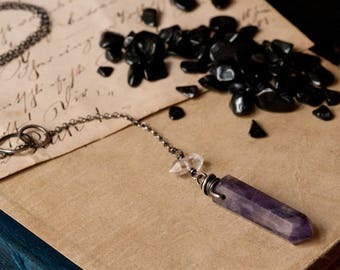 One of my first experiences with divination was with a pendulum and even today I enjoy the simplicity of this method for enhancing and directing your intuition and sixth sense... this solid brass pendulum has been paired with a faceted amethyst bead - a stone known to enhance psychic ability, it can help to calm the mind encouraging a meditative state prior to reading and it acts as a powerful psychic protector. 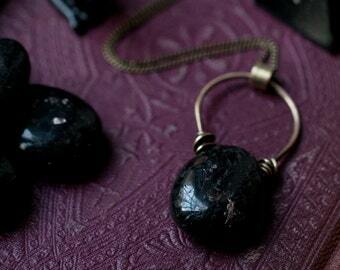 You can choose between gently antiqued brass or silver plated (with a sterling silver chain) or gold fill. The gold fill version comes with a 24k gold plated pendulum and uses wirewrapping and not soldering to secure all of the connections, this helps to maintain the integrity of the gold top layer. 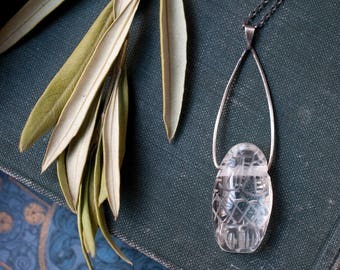 The silver version has a sterling silver chain and a silver plated pendulum. 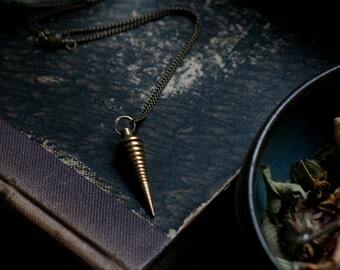 The chain has a front closure via a hook and eye clasp that also allows you to transform the the pendulum into a necklace. 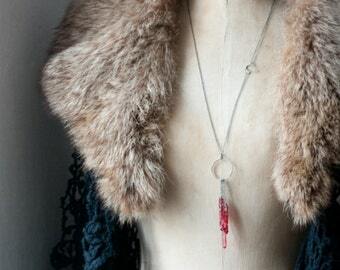 The necklace is 16" with a pendant drop of 4" for the pendulum. 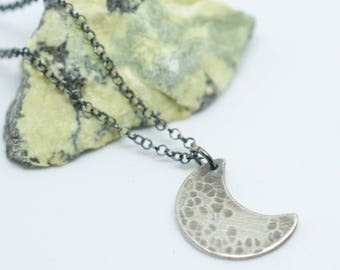 Crescent moon necklace, sterling silver, moon charm, moon talisman, miniature amulet, oxidised silver pendant, moon goddess necklace. Amethyst pendulum, amethyst necklace with herkimer diamond, silver gemstone pendulum necklace, divination, amethyst point, natural amulet. 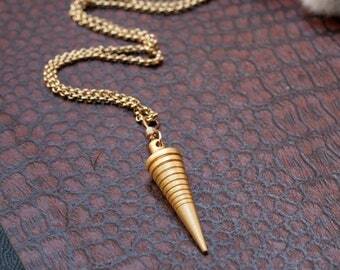 Absolutely love my pendulum! Looks exactly like the photo, and works perfectly!! 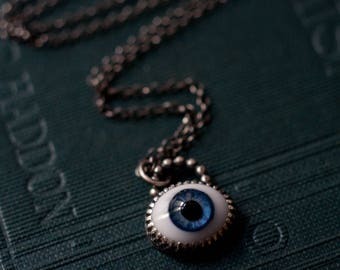 Glass eye ring, evil eye protection talisman, dolls eye, sterling silver eye ring, fancy gallery wire and hammered band, stackable ring.